Screen printing and direct-to-garment (DTG) printing are two of the most popular ways to print a design onto fabric. 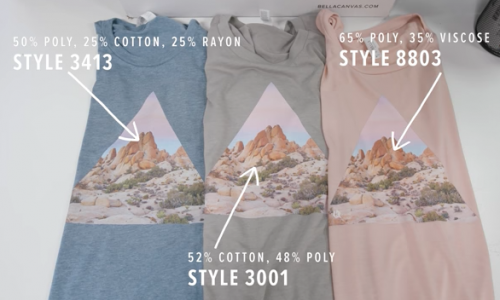 While there are many ways to print a design on a t-shirt, tote, or piece of merch, these two approaches are the go-to methods for good reason. Let’s look into them in more detail. Screen printing is the process of pulling a layer of ink over a specially crafted screen (usually with a mesh stencil) in order to produce a custom design. DTG printing applies ink directly onto the t-shirt using inkjet technology. There’s no silkscreen or paper applicator; it’s just like printing on paper, except on fabric. It’s easy to see why these methods are the most popular. Not only do they produce truly stunning works of art, they can also both be customized to meet the diverse needs of a growing audience. In order to know whether DTG or screen printing is the right choice for your next order, it’s first important to understand the unique benefits and limitations that each has to offer. Here are the 4 most important factors to consider when deciding between screen printing and DTG. The first thing you should consider when thinking about printing method is the size of your order. Are you a boutique brand looking to make limited edition prints? Or are you a lifestyle brand looking to cast a wide net? DTG printing is a great option for low volume orders. The digital process is set up perfectly for small batches and one-offs as it avoids the heavy setup time and setup costs of screen printing. However, DTG is simply not cost effective for larger batches. Each shirt has to run through the printer one at a time and at the same cost, so you aren’t afforded any volume discounts. Screen printing, on the other hand, is best for high volume orders. Remember, a special screen gets made for each design in screen printing. This gives the method a high upfront cost. 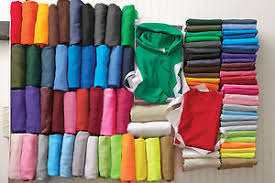 But the cost per garment decreases exponentially as you increase the volume, so it becomes more and more economical the larger your order gets. Next, consider your design. Do you have an awesome design idea where your logo is enveloped by a stunning sunset, with intricate oranges and reds and blues atop a mountainous horizon? Or do you want to make a simple, handsome tee with just your brand’s name and logo on it? If you’re looking to print multiple colors within a complex design, DTG is likely the best option. Because a DTG printer is just as precise as a paper printer, it can print images in much greater detail than screen printing. This enables much more intricate, complex designs. On top of this, you’re not limited in color. The specialty printer can literally duplicate any image you come up with, so you have tons of flexibility to jazz up your design. 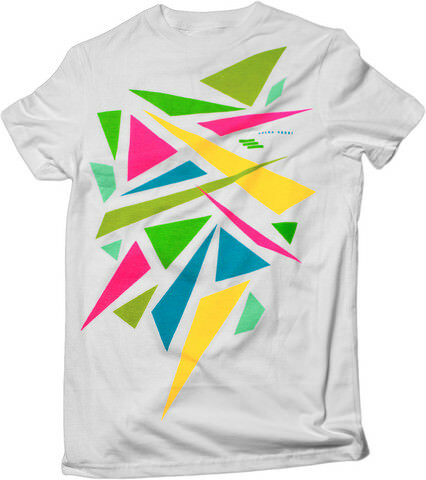 Screen printing, on the other hand, is best for designs with simple designs and limited colors. With screen printing, only one color can be applied to the screen at a time. Because of this, each new color requires more time, another screen, and ultimately, more money from you. This isn’t to say screen printing colors aren’t vibrant. They are, perhaps even more so than DTG. Screen printing is just more hands-on, which makes highly stylized and colorful orders more difficult. The next factor you’re going to need to consider is your preferred fabric. Are you a streetwear brand looking to make cotton hoodies? Or are you a high performance fitness outfit looking to make highly synthetic workout gear? Screen printing is more forgiving and versatile than DTG, which makes it easy to use on a large variety of materials. Whether you want cotton, triblend, poly, or some highly specialized blend, screen printing has the versatility to adapt to you. That being said, make sure to choose screen printing inks that match well with the type of fabric you choose. For example, stick to water based and discharge inks when printing on lighter fabrics and blends so your garment remains soft and smooth. In addition, the versatility of screen printing allows for unique products like handbags, koozies, mugs and backpacks as the printer is able adjust to curved or uneven surfaces. DTG, on the other hand, works best on 100% cotton. Anything less than 65% may not print completely true to color. 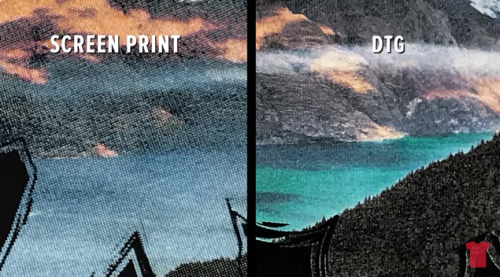 Also, it’s important to remember that certain blends react differently to DTG printing than others. We’ve seen some surprisingly great results with some of our products, you’ll just need to do some sampling first. This one’s totally subjective. The look of a screen printed item vs. a DTG item are just a bit different. For example, a screen print is traditionally a bit more vibrant, while DTG is more adept at nailing that vintage effect. This is because screen printing ink is applied thicker than DTG ink, which results in stronger colors. This is important to remember if you’re printing on a darker colored shirt and still want your design to pop. Remember: this is art, not science. Each printing method reacts to each design differently. Make sure to sample, sample, sample so you can hit the exact look you want. Screen printing and DTG are both great options. Both methods are itching to bring your awesome design to life. We’ll even help you decide which works best for your brand. You win.